Holy Trinity Catholic Church has begun its annual participation in the Pastoral Services Appeal (PSA). Some folks have asked me “why do we have to do the PSA every year?” The short answer is because we are a Roman Catholic parish in the Diocese of Orange and the monies raised provide resources for ministries specific to the Diocese, but which help us as the people of God. What are some of those ministries? These ministries include Catholic education, outreach ministries to the hungry, homeless and incarcerated, and the formation and education of religious vocations, particularly seminary for those studying for priesthood. Each of these ministries supports the Christian mission of our Catholic Faith. Additionally, each Catholic in Orange County is the recipient of the benefits of such diocesan ministries, if not directly then by extension. This is why it is necessary for all the faithful of our Diocese to support this appeal. Since statistically Catholics give, on average, less than 2% of their household income to support the works of our Church, the PSA is necessary to close the gap and provide the finances necessary to continue supporting our Catholic faith. 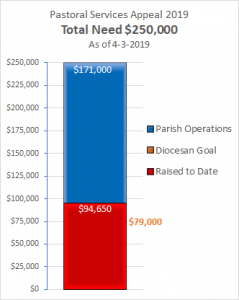 Our Bishop knows that giving to the Diocese can affect giving in individual parishes. So, through the PSA, we can also support Holy Trinity. Every dollar pledged over our goal of $79,000 will return back to Holy Trinity. If you’re a long time parishioner you might remember that our first buildings – the current Office and Hall – were mainly funded through PSA rebates. With this in mind, I’m asking to please support the PSA generously so it can help us to pay Holy Trinity’s operational bills. In my recent letters, I have been asking for full financial participation by our Holy Trinity family so we can fund our day-to-day operations. Until we see that our regular Sunday offering has reached a level to fully sustain our day-to-day operations, we need the PSA rebates to help pay our bills . Therefore, we are setting our own Holy Trinity goal of $250,000 to help us meet the increased costs of operations for the year. Meeting this goal means that Holy Trinity will receive $171,000 in operational support. That’s just about the number we need to fund Holy Trinity operationally. Please pray these next couple of days to see what type of support you can consider. And if you are ready to make your pledge today, click here .You can find out more information about the PSA here. I thank you in advance for your consideration and response.